The community of Lisacul in Ballaghadereen have donated €22,500 to The National Burns Unit at St. James’s Hospital. The fundraising organisers, led by Martin Tynan and his family of Kiltymaine, Lisacul, presented a cheque to Odhran Shelley, Consultant Surgeon and Director of The National Burns Unit, at The Village Inn in Loughglynn on June 1st. The community fundraising effort was undertaken as a memorial to Martin’s eldest son, Kieran, who died in a fire in Western Australia in 2011. The donation is a windfall for The National Burns Unit, whose staff aims to raise €500,000 over the next two to three years to provide new equipment and infrastructural changes that will directly improve their possibility to care for patients. While at first the fundraising organisers had planned supermarket bag-packing, a deer barbeque, waxing, shaving and dyeing and church gate collections, local enthusiasm for the project spiralled and a myriad of other initiatives were also undertaken. 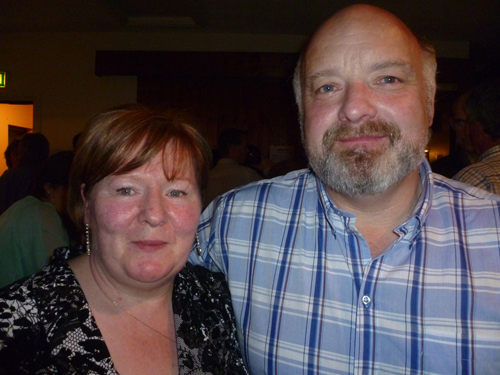 The social night in Loughlynn was arranged by the Tynan family and the fundraising committee as a thank you to the community, the local businesses who had supported and local people who had collected and donated, and all of those who had contributed in so many ways. Martin Tynan said: “Our family and friends set out, with wishful thinking, to raise funds for future burn-injured people as a memorial to Kieran; we have been overwhelmed by peoples’ generous support.” He said he was very proud of Lisacul and the surrounding areas, and that the group’s wishful thinking had come true; he continued: “Considering that our village has one pub, one church and one school, the result has been fantastic.” The committee has plans to undertake an annual church gate collection on the last week in May each year for the benefit of The National Burns Unit. The National Burns Unit at St. James’s Hospital caters to severely burned patients from all over Ireland. Patients are admitted following house-fires, construction accidents and other traumatic incidents – suffering from burns ranging from 1 – 2% of their entire body skin to 90% and higher. A multi-disciplinary team provides specialist care for more than 200 people each year.